The YB-49 never entered production, being passed over in favor of the more conventional Convair B-36 Peacemaker piston-driven design. There were several other extenuating circumstances according to a number of sources. John Northrop was not always the easiest person to work with so made many enemies at the Pentagon, while Convair, had a strong lobbying group in place after years of working closely with Air Force decision makers. While it is true that the YB-49 did have a tendency to yaw, a real issue with a strategic bomber, that could have been worked out. The YB-49 was also able to be upgraded with larger and more powerful engines, something that one could not do with the B-36. The B-49 was also extremely strong and would not have been prone to structural issues, something that plagued the B-36 for its short operational life. Quite a few aviation experts feel that the B-49 would have lasted in service nearly as long as the B-52, but it was not to be. 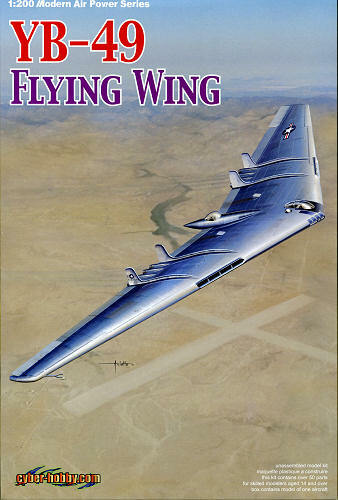 Design work performed in the development of the YB-35 and YB-49, nonetheless, proved to be valuable to Northrop in the eventual development of the current day B-2 Spirit strategic bomber, which first entered operational service in the 1990s. One does wonder if this is based on the earlier die cast release, but I doubt it as the level of detail on this kit surpasses what one would normally find on a die cast offering. With only 50 parts, the kit is not going to be labor intensive. The upper and lower wings are each a full span and one simply paints and builds up the few pieces for the cockpit prior to closing the halves. There is actually quite a bit of detail in the cockpit/crew area that includes a flight engineer and gunner's stations. A rear gunner's position is also nicely detailed for this scale. Despite its small scale, the kit has a wingspan of over 10 inches. Though no stand is provided, one can build the kit with the gear up and inserts for the gear wells a re provided for that purpose. The upper and lower wing fins are a single piece as are the eight jet pipes. Transparencies are well done and should be easy to install. Though no weight is shown, I would put a bit on either side of the cockpit just to be sure. Instructions are a single sheet of paper with the four construction steps on one side and parts layout/painting guide on the other. No interior/well painting information is supplied with the bottom of the box providing exterior color data. 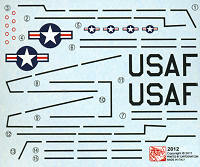 The small decal sheet is well printed and provides all the wing walk borders. However, it is missing the serial number of the aircraft, which was carried on the outside of the outer upper fins. As a note, in most photos, the aluminum shows a nearly uniform sheen, though it very much was bare metal. If you are lacking the shelf space or asking price of Italeri's reboxed 1/72 YB-49, you should seriously give this one some consideration. The kit has alternate clear bits so it may well be that we will see a YB-35 or possibly YRB-49A in the near future.